Yesterday was as busy as it can get. 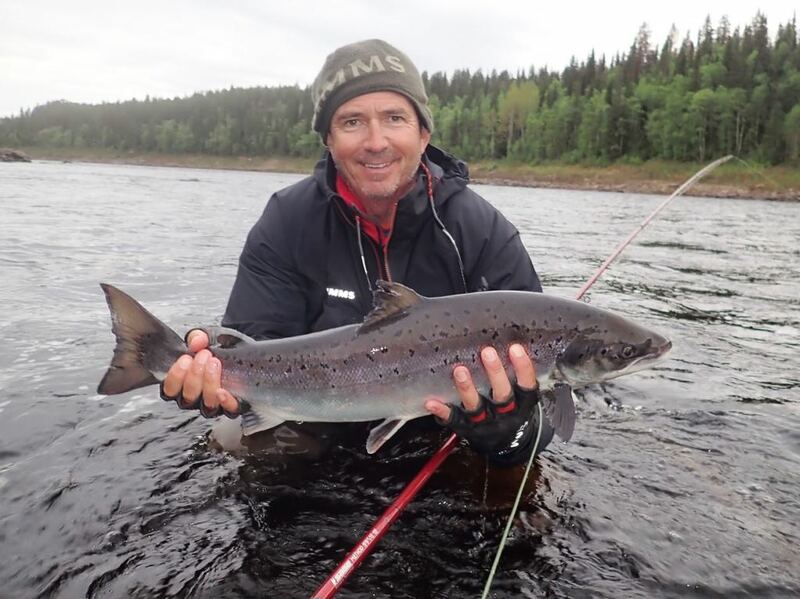 A 6:30am departure from camp to get to Murmansk in time for the charter and then almost as soon as we had got to the airport, the new weeks clients were coming through immigration. With all of the rivers on the Kola now up and running, the arrivals hall was manic and it was an intense couple of hours. However, we got everyone on to the helicopters in very short order and we were in camp at around 3pm which was pretty speedy. Everyone had a few hours on the river and quite a few fish were caught. 7 at Lower, 6 at Middle, just the one at Kitza and 13 at Pana which was hugely encouraging. 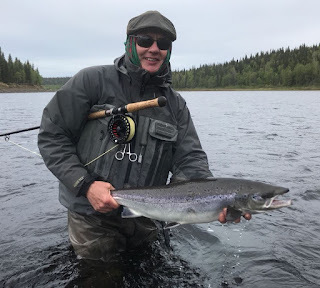 Last week was a strange mix of very good salmon fishing whilst at the same time not being as productive as we have known the river to be. 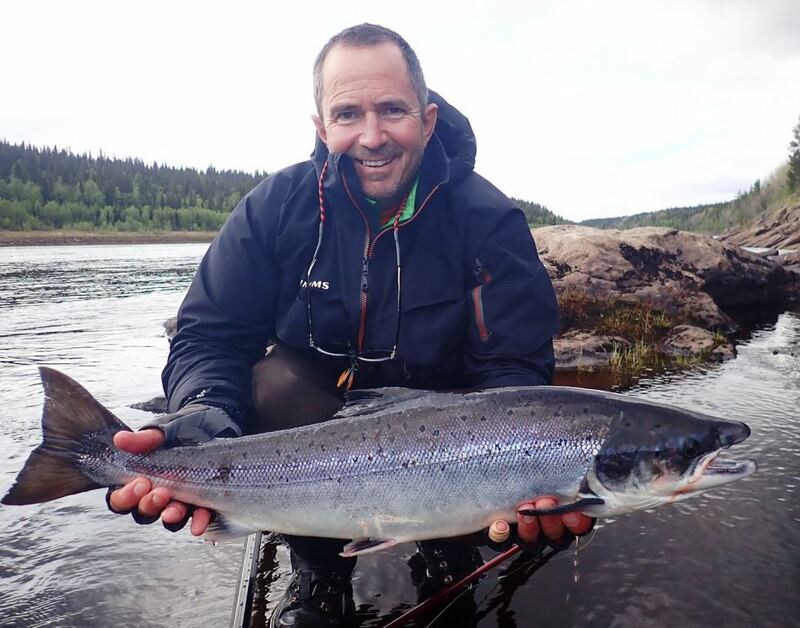 We landed 468 fish in the week across the 4 camps and it sounds positively greedy to ask for more than that but we have caught more in the past and it just felt as if the grilse run had not been as prolific as usual. 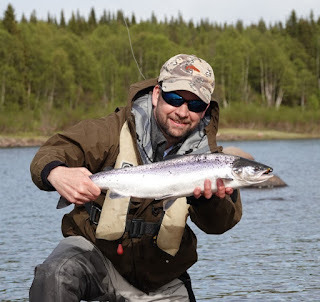 Having said that, all of the fish we landed yesterday were grilse and a lot more were showing in our home pools at Lower so they may just be late. It was very good to speak to those clients on the way home, some of whom had definitely been caught up in a “last night of the week” party. Everyone was hugely complimentary about the staff in the various camps and many made specific mention of the excellent food this year. It is not why people come but it is good to know that things are being done well. As has been the case for many a year now, Eoin Fairgrieve and Bill Drury are heading up the “Ultimate Atlantic Salmon course” this week here at Lower. With two world class instructors at your beck and call, a falling river and one which has fresh fish coming in all the time, there is no better week for people to improve their skills. As a result, there was more fishing gear on show this morning than the average tackle shop has in stock as everyone was asking for opinions on what would work and what they should fish. 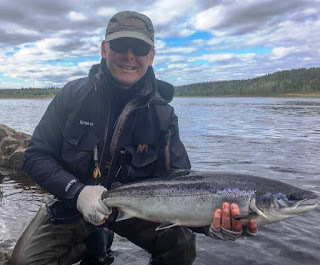 However, Stuart H did not need any of that advice as he went out and landed 2 fish before breakfast to give our week a very positive start.